Banks and relationships are as old a pair as slice bread and butter knife. I can imagine my grand father getting shivers allover when he deposited bulk of his first salary in the bank wondering all he was left with was a stupid passbook with illegible numbers on it. The point is days have changed! The grand dads are no more, niether are the passbooks. The last time I walked into a bank was to pay up my education loan interest and it took them 40 mins to accept my payment. If I remember correctly I got my loan approved in less amount of time than that. 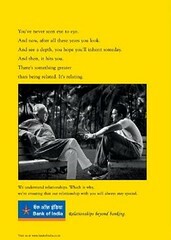 I saw a couple of rather cute and heavily touching Print Ads by Bank Of India sometime back in Hindu. See them for yourself here. I wanted to findout whether bank really cares so much about relationships. So I headed over their website and in a matter of few minutes I could figureout atleast 4 things that are not in tune with their market positioning (or something they wish to achieve). 1. There is no login link / box in the home page. Where is the time for 9-7 employees to go to bank to get pampered by relationship managers? 2. Advertising in Chennai and none of the pages are in any language other than Hindi / English. 3. If the web page itself is so cluttered and confusing and cant really maintain relationship with its viewer, what are you talking about relationships with your customers? 4. They have a feature called multi branch banking. Hello! but isnt banking supposed to be Multi branch always. Sorry, if I am not my great grand father. May be you can find something else that is not inline with how they want to be percieved in the public. I think the entire money spent on the advertising is down the gutter unless the organization aligns itself to what it wants to project or how it wants the public to see them.